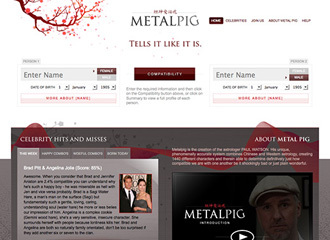 Metal Pig is the conception of the astrologer Paul Watson. The company's aim is, in the most simplistic and honest fasion, to make people aware of just how comaptible they are. "The Hatchery? Terrific company. Professional, prompt, efficient, courteous, polite and fantastically knowledgable. I wouldn't hesitate working with them in the future." Build a website that makes running compatibility matches between two people as simple as possible, thereby helping people to make suitable relationship decisions. Engineer the algorithms in such a way as to provide the rich content and results from the matching engine in a swift and well presented manner. The mathematics behind Paul's genius matching algorithm is exciting - well at least for the technical geeks in our company. 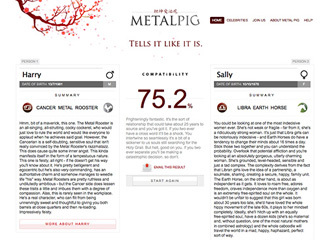 We engineered a powerful matching algorithm that translates basic personal information into compatibility results the equivalent of those that Paul's firing synapses in his brain would ordinarily provide if you asked him to do so. 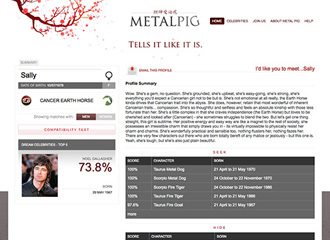 The result: an incredibly interesting matching engine that drives the strong, yet simple, brand and beautiful website. Note: The website has undergone a number of re-branding exercises, and can currently be found at http://www.somebodytolove.com - a site we have built but not designed in its entirety.